IDF reports that soldier seriously wounded during terrorist infiltration next to Beit El was not only struck by rock, but also stabbed. An IDF soldier injured after an Arab terrorist infiltrated into an army post next to the Israeli town of Beit El north of Jerusalem was stabbed during the attack, an IDF spokesperson revealed Friday afternoon. According to the initial report Friday morning, the IDF soldier was seriously injured after an Arab terrorist infiltrated into the IDF post adjacent to the town of Beit El. The terrorist snuck up on and attacked the soldier, and in the ensuing fight, the terrorist hurled a rock at the soldier from close range, injuring him. But IDF officials now say the soldier was not only struck by a rock, but also stabbed during the attack. The army also reported that during the struggle, the terrorist was also injured, forcing him to flee. After being treated on the scene, the soldier was evacuated to Hadassah Ein Kerem Medical Center in Jerusalem in serious-to-moderate condition. Upon his arrival at the hospital, the soldier’s condition was listed as serious. Israeli security forces are searching the surrounding area for the terrorist. 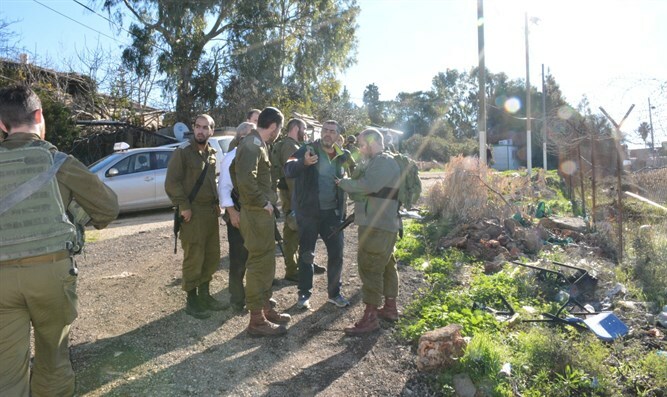 Friday’s attack is the latest terror incident in the Binyamin district of Samaria. On Sunday, Hamas terrorists opened fire on a group of Israeli civilians at a bus stop next to the town of Ofra, just north of Beit El. Seven people were wounded, including a 21-year-old pregnant woman, who was forced to deliver her child in an emergency caesarian section as a result of the attack. The child later died as a result of the attack. On Thursday, terrorists shot and killed two Israeli soldiers near Givat Assaf junction outside of Beit El. Two other Israelis were wounded in the attack. Shortly afterwards, a terrorist driver rammed an IDF soldier in El Bireh, outside of Ramallah, injuring him. The terrorist was then shot and killed. Overnight, IDF forces captured 37 Hamas terrorists in the Ramallah area.